We’re having a snow day here in the Chicago area. No school (except for me, I go to grad school online and work from home as a matter of course). Little Guy is home today and playing with his Transformers. My neighbor has a Camaro and he got stuck in front of our driveway, then again a couple houses up, and one more time another house up. He turned around and came back. He was going to have to call in, but it’s difficult when you work retail. Luckily his boss lives nearby, has an SUV, and was on a four day weekend so he was available to drive my neighbor to work. We have a Yukon XL. This kind of weather is one of the reasons why. The two mile trip to the train station was not too bad, but smaller cars with rear wheel drive and those with front wheel drive were having difficulty on even slight hills with the amount of snow on the ground. 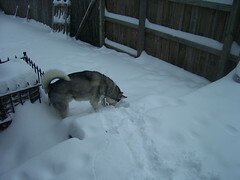 Nikita the Siberian, however, is in his element! So said Clinton at last night’s debate. But she didn’t know then what she knows now, nobody knew then what they know now. All she’s doing is giving excuses for voting according to the accepted knowledge and wisdom at the time. She should have said that. She should have accepted responsibility for voting according to the best available information. Hindsight is 20/20. It’s far easier to explain away a past decision based on present knowledge rather than accept that you made the best decision you could based on the knowledge available then.